Fashionistas, gear geeks, techies, and just plain recreational skiers and riders, it’s time to shop till you drop. The sales are on and, oh my, what you can learn from a saavy salesperson, boot fitter, or renter/demo expert! Like the latest trends in goggles, helmets, mitts, poles, and boots and how high-tech translates to comfort and fun. Last week I wrote, “The fashions are colorful, the gear rocks, and both are more than ever technical than ever – and guaranteed to make you more comfortable on the slopes.” Well, that goes for the accessories, too. When I stopped into a few shops to check out what’s new or hot, I felt like a kid in a candy shop who was being beamed up to the Star Ship. Here’s what I learned and why you ought to check out the sales and/or attend Demo Day at Killington this Saturday and see for yourself. 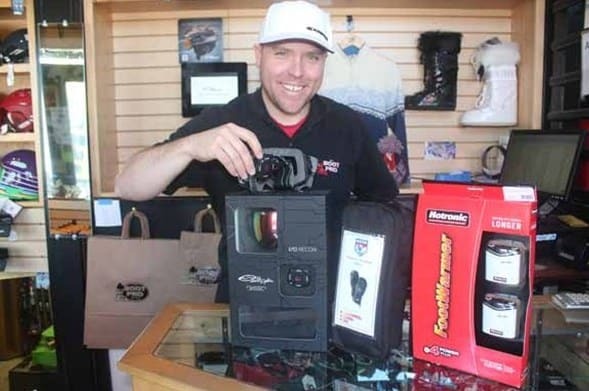 When I stopped in to see the guys at the Boot Pro in Ludlow, I chatted with Matt Tripp, asking what’s hot or new in accessories? He showed me the Recon I/O Goggles from Smith Optics. They blew my mind. It wasn’t the anti-fog lens or 3-Layer DriWix Face Foam technology that amazed me most, though. It was the MODLive Technology features which utilize GPS and Bluetooth so you have this tiny screen inside the goggle, which gives you everything from your speed, jump analytics, altitude, distance and even resort points-of-interest, text messaging and music playlist management. You can track your buddies who have them as well, Tripp said. The retail price of $650 makes this a definite one for the have-to-have-it-all techie. Michael Boisvert, of Evolution Freeride at the Basin Sports Shop in Killington, is another tech-saavy salesperson who delights in explaining what’s new. He showed me a pair of more “normal” goggles that technology has improved for the rest of us. This includes easy pop-out lenses so you can exchange them with the second pair that came with them (one for flat light and one for sunny days) or replace as needed. The lens frame is made from a sturdier rubber that is more pliable; there are better foams that keep the face drier and warmer; and silicon strips on the inside of the straps enable them to stay on the helmet better. Different shapes fit different face shapes and help to do away with air gaps for less tearing at speed. There are improved photochromatic lenses that work better in temperatures below 32 degrees due to new coatings. Noting that poor air circulation is what causes lens to fog up, Boisivert stressed a good fit with the helmet is essential. Some helmets now have vents built in that assist the air circulation for the goggles, he said. Helmets have seen huge improvements in materials and features, too, and designs and colors are more stylish now as well. Some feature built-in technology like Bluetooth adapters for music. There are integrated headphones and plugs for cell phones and ipods. These and other changes are among the many that make helmets safer and way more comfortable, Boisvert noted. If buying new goggles, bring in your helmet and vice versa to ensure a good fit, he advised. Tripp couldn’t help but point to two “hot” items in the accessory trends department. First, the Hotronic electric heating system works well in boots and sells well for those who need more help in keeping their feet warm, he said. They have a heating element which the shop installs on the customer’s insole and a battery bracket they place on the boot. With four heat settings and rechargeable lithium-ion batteries, they retail for $239. There are optional extension cords for those who want to attach the battery pack at the waist or elsewhere. Second, were the Power Heater Mitt ($380 retail,) which proved to be a very popular item! After trying out the item last year and selling out, the shop ordered more this year and sold out again. Technology really has solved problems for people who get cold easily, Tripp said. Shon Racicot, owner of the Boot Pro and a Master Fit University certified boot fitter, notes the importance of stance analysis and balancing. The goal is to “match a boot to an individual and then customize it to maximize the skier’s performance. Ski boots can be customized using various techniques to accommodate any individual foot irregularities, he said. “Footbeds are most important,” he added, saying they are “the foundation to good balance.” They are customized to an individual’s feet and are a good investment that can make a big difference in one’s skiing. Additionally, boot shells and liners can be altered to accommodate such problems as bunions, bone spurs, circulation difficulties, and injuries. “These modifications can greatly improve a skier’s comfort and performance,” he stressed, noting no one should suffer from sore feet or the problems created by ill-fitting boots. Such simple devices as heel lifts can help correctly align the body for better performance, particularly for women, he added. Better materials allow for making warmer and more comfortable liners – some are heat moldable and there are foam-filled customizable liners also. Boot fitter Amy Smedley at the Basin added that boots are better than years ago because they are made from newer plastics that are softer and allow for more flex. Some new plastic shells can also be warmed and molded to fit an individual’s feet. The level of customization can include shell, liner, and footbed depending on a person’s need, she said. Some are lighter, others sturdier, and some feature more convenience such as adjustability. There are neon colors and even prints. The materials vary with aluminum being strongest, but the new composites like carbon and fiberglas are lighter and more flexible. Some come with different or extra baskets that you can screw on or off for powder days. The latest technology from Leki features a Trigger S grip, which consists of a velcro strap that is attached around the glove and clicks onto the pole for easy on and off and reduced chance of injury in falls. Bill Langlands of the Darkside Snowboard Shop noted that with so many changes in technology, there are different boards for different purposes and types of riders. After talking to a rider and finding out more about them – ability level to where they ride – staff can recommend two or three boards that they might like. They demo and buy the one they like “the feel of,” he noted. Some people know what they want, but most don’t and that’s where a knowledgeable salesperson can offer valuable assistance, especially with all the changes with camber, full rocker, and various combinations of rocker and camber now found in snowboards. “Boards have never ridden better,” he stated, but the choices can be confusing so demoing is a good idea. At Northern Ski Works, Scott “Scooter” Watelet explained that people rent or demo for a variety of reasons including: they are just learning, don’t ski often enough to merit the purchase, want to be on the latest equipment or don’t want to haul skis up with them from the cities. Rental packages are inexpensive and provide the occasional skier with good value, he noted. Regular rental skis have the new technology of sidecut and rocker but tend to be narrower under foot, which makes them user-friendly. Watelet reports seeing a 60 percent increase in demos this year. Noting the latest trends of wider skis (88 mm-width and up under foot), and rocker, he said that rocker is a definite advance for all level skiers. “If you take a 95 mm wide ski with no rocker, it skis like a tank, but with rocker it has more float for powder and crud and with camber it handles well on firm and crunchy,” he said. He cited the Blizzard Bonafide with its 98 mm width under the foot and patented Flip Core 3D technology (the rocker is naturally built into the ski during construction in a core built process) as outselling other store skis three to one. He said 80 percent of the store’s demo skis have rocker or early rise, some both tip and tail and some just tip and a few, like a park ski, have no camber so they can smear a turn. This Saturday, April 13, local shops will be offering free demos which will give skiers and riders a chance to experience what the new rocker and blends are all about – and see how they perform on the variable conditions that spring brings. The demo event will be held by Killington’s Roaring Brook Umbrella Bars where there will also be a Vermont Brewfest going and Conniption Fits will play a live set from 2 to 5 p.m.
Additionally, Killington will provide Season Pass Holders with a free BBQ lunch as part of Passholder Appreciation Day.